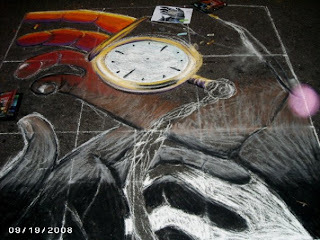 Well the groundSpark Street Painting Festival was this past weekend, and man did I have fun! My teammate Amber and I had a blast even though we didn't win anything. Amber wants to do it again next year to win--she's really, really competitive. Our concept was restoration and not forgetting about the past, but somewhere along the way, we failed to communicate that. What people were getting out of it though was the hands of time, and I think that's pretty cool, too. There were a few things going on Friday night, but Saturday was when the real fun began for spectators. There were vendors selling some of everything, there were free workshops, there were graffiti artists competing against each other, and there were break dancers. There was also some stuff going on that night for Spark After Dark, but I didn't stay... Sunday had a few events going on as well. Downtown Raleigh is stepping up, and lately, it's been stepping up big.